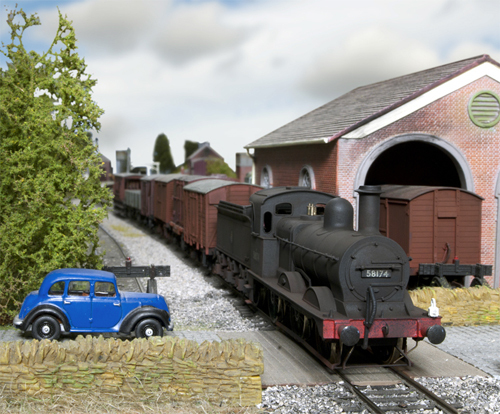 As I mentioned in my post earlier this week, I shall be assisting Hornby Magazine editor Mike Wild operate his Berrybridge layout at the Stafford Railway Circle exhibition this weekend (4th/5th February). The Stafford exhibition, held at the Stafford County Showground (with ample free parking), is always worth a visit with over 30 layouts and 40 traders in attendance there is bound to be something for everyone. Berrybridge was originally built for an article in the magazine to prove that layouts do not always need to take years to complete and indeed could be built within 100 hours but in fact it only took 75! It is based on a small freelance ex Midland station on a cross country route with a typical passenger and freight service serving the station and a small good yard. A small loco servicing facility is also included for good measure. The end to end format with turntable sector plates at each end allows for simple operation of quite an intense service. This ensures that viewers have something to see moving most of the time, which is something of a philosophy with the Hornby Magazine layouts. One of the operational interests of the track plan is that generally trains are not able to pass in the short station loop necessitating freight to make use of the lie-by siding to allow other trains to pass. As is usual I am sure I will answering many questions and politely advising some visitors that firstly, Mike Wild is in fact old enough to be a magazine editor and that I am not he; and also that the magazine is published by Ian Allan not Hornby Hobbies, having no connection to them other then the use of the name!